Located near the intersection of 34th St N and 3rd Ave N, Extra Space Storage serves St. Petersburg residents near Historic Kenwood, United Central, Childs Park, Jordan Park, Melrose-Mercy, North Kenwood, and Downtown St. Petersburg. Locals will recognize our facility just north of Walmart. Are you a college student in St. Petersburg who needs self storage over the summer or while studying abroad? Extra Space Storage is about 3.7 miles from the USF St. Pete campus and 4.9 miles from Eckerd College, so we're an easily accessible option for students! Extra Space Storage on 34th St N has a wide range of storage units, climate-controlled storage, and exceptional security. We're the storage solution for you in St. Petersburg near Historic Kenwood! 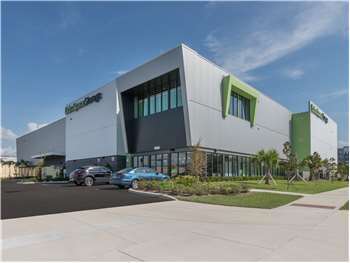 Units at our St. Petersburg storage facility come as small as 5x5 and as large as 10x30 with convenient features like indoor access, first-floor access, and elevator access. We've equipped our 34th St N storage facility with security features like electronic gate access and 24-hour video surveillance to keep your belongings safe at all times. Worried about storing temperature-sensitive items in St. Petersburg? With climate control, your items will be safely kept in an environment between 55 and 80 degrees year-round. Not only does Extra Space Storage offer high-quality, reliable self storage, but our customer service is also the best in the business! Our friendly, professional staff goes above and beyond to ensure your needs are taken care of, and they're more than happy to help whenever you need it. Contact us today to reserve a storage unit in St. Petersburg! The guys in the office are helpful and friendly. The storage facility is immaculate. I feel very safe when going there in the evening. Friendly, clean, helpful, large units. This facility seems well run and I would definitely recommend. Great place to deal with. Personnel are courteous and friendly. I feel very confident and safe while keeping my belongings and while visiting the site. Gr8t all the way around. I was impressed w/the agent, cleanliness of building as a whole. Staff very nice & informative. Great location and best price. The facility was spotless and very clean. Access us easy and very secure with great hours. The staff was very professional and courteous. Just a great experience. Staff is was very professional. The moment I walked in he made it all about me, by taking the time to show me sizes and prices. Super clean storage. The storage had equipment there to help with moving things up and down the elevator. Nicest storage facility I’ve ever been to. Very clean and I found the employees very nice. ExtraSpace employees have demonstrated quality service that impacted my decision to choose them as my storage company from previous companies have I previously used. Great Job!!! Drive south on 34th St N. Pass 5th Ave N and continue south. Turn left onto Burlington Ave. Our facility will be immediately on your left. Drive north on 34th St N. Pass 5th Ave S and continue north. Our facility will be on your right after Walmart. Drive west on 1st Ave N. Turn right onto 34th St N. Our facility will be on your right after Walmart. Drive east on 1st Ave S. Turn left onto 34th St N. Our facility will be on your right after Walmart.